Lavinea's Room is a relaxing place to watch the sunset. Let all your worries disappear as you soak in the claw foot tub. Lavinea also was a granddaughter. 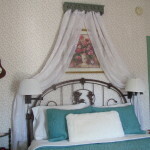 Cherubs adorn the queen-sized iron bed in this charming, cozy room. Snuggle on the soft luxurious bedding and watch the sun set out the window. 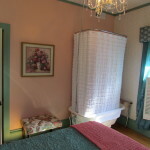 Enjoy the old-fashioned claw foot tub or relax in the shower as your worries melt away down the drain. 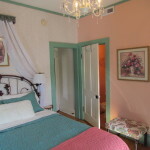 This bright room in adorned in sage green and coral, creating a restful getaway. Your private attached bath houses the sink and commode. 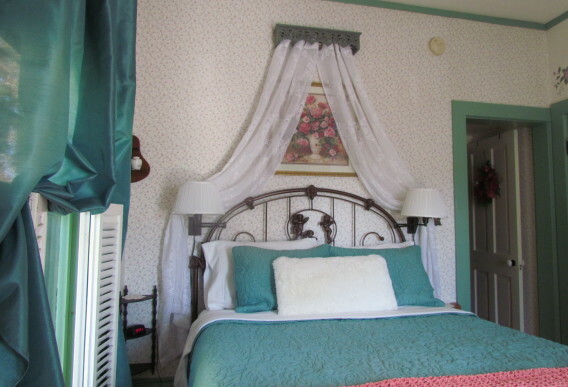 Amenities include: Private bath, TV, alarm clock, personal safe and antique armoire.